29 July 2016, Friday. After breakfast, I spent the morning in Siem Reap wandering around town. I’m not quite a shopping person, so last night’s walk along the night market didn’t quite excite me. I’ve been away for more than a month now, and it was about time I got myself a haircut, lest I start turning into Tarzan or Robinson Crusoe. 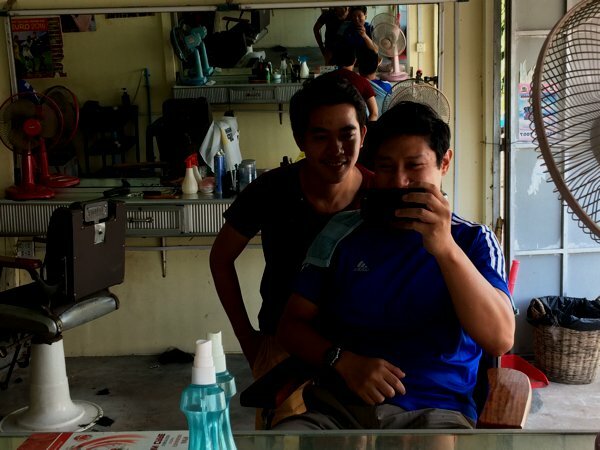 Got myself a haircut at a nearby barber. USD2. 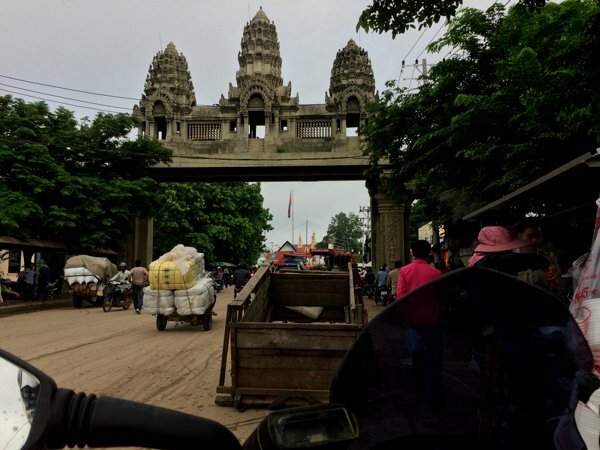 Rather reluctantly, I left Siem Reap and headed to Poipet – the Cambodian-side town of the Cambodia-Thailand border. My GPS tells me that I should reach Poipet at approximately 2pm, and I was still deciding if I should put up the night at Poipet or if I should just head over to the Thailand border town of Aranyaprathet. 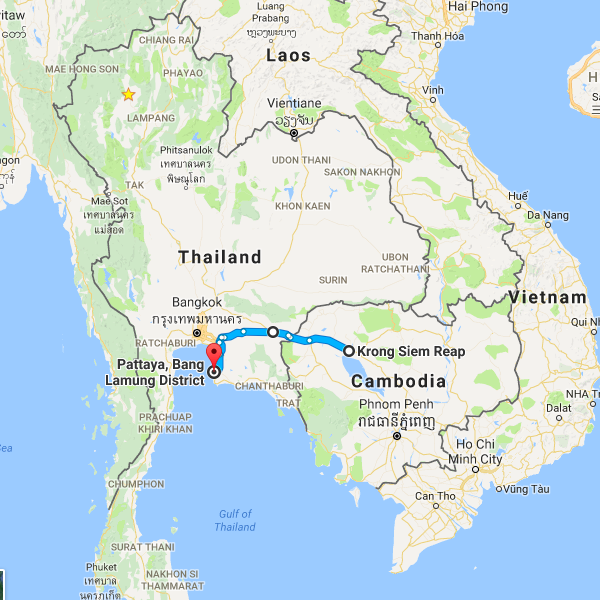 If you google the Poipet-Aranyaprathet or the Poipet-Klongluk border (same thing – Aranyaprathet being the nearest Thai town to the border, and Klongluk’s the name of the Thai border itself), you’d realise that it’s infamous for border corruption and basically a overland traveller’s nightmare. And when I reached Poipet, I really didn’t have to decide. The skies opened, and started pouring. So I just got myself a room for USD11 and stayed for the night. Knowing that this would be the last day in Cambodia, I tried to expend the remaining Riel I had with me. 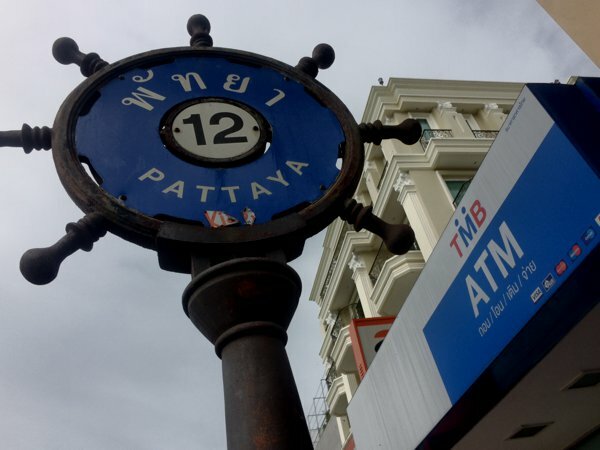 Funny though, almost everything in this town is quoted either in Thai Baht or US Dollar. And when asked for the equivalent in Riel, most merchants have to take out a calculator to compute the amount. The Cambodians seem to hate their very own currency. There’s really nothing much to do in Poipet. Kinda reminds me of Stung Treng, but even quieter. I don’t see any tourists around. 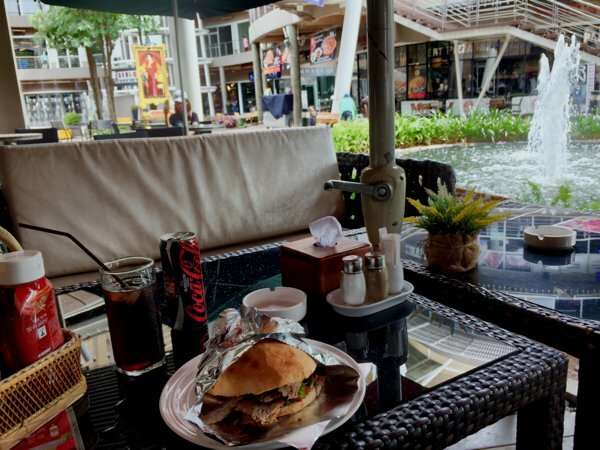 And even if so, Poipet would likely just be a stopover before heading to Siem Reap or Phnom Penh, or crossing into Thailand – definitely not a destination of choice in itself. I’ve read that Poipet is like the rest of Cambodia time-travelled back 20 years ago. I arrived at the Poipet immigration control at around 0740h. The place seem crowded – not with tourists, but with locals. I think the immigration office is somewhat new, as I’ve read that it used to be a tiny hut. It’s now a proper building with multiple (I recall 2 or 3) counters opened. I joined the queue and didn’t have to wait long. Presented my passport, they took a picture of me (Logitech c920 webcam, again), and had all 10 of my fingerprints taken (electronically, not inked.) My passport was stamped, and swiftly returned to me. No fees asked. Really? I smiled to myself. The Poipet immigration control. Roadworks is still going on. After immigration, I proceeded towards the border control. The locals in their scooters were just zooming past the border control. I slowed down (as I always do at border controls), and was pulled to the side by the border control officer. He asked for my passport, and I showed it to him. He noted the exit stamp and waved me on. No fees asked. 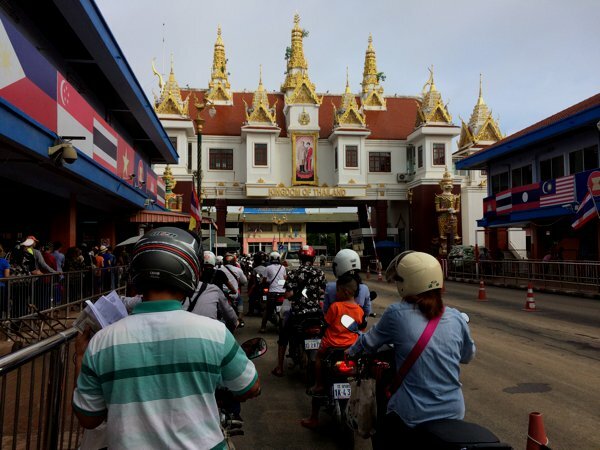 As I moved on, I was looking out for the Cambodian customs control – hoping that I wouldn’t have any issues with my bike. I didn’t spot any customs control, and before I realised it, I was joining the immigration queue on the Thailand side. Leaving Cambodia. The distinct Khmer / Ankor styled gateway. Joining the Thailand immigration queue. Notice the border building has a very distinct Thai-style to it – lots of gold and the King’s picture on it. When I reached the Thai immigration border, the immigration officer seem to be at a loss as to what to do. I suspect that the majority of the overland travellers on their own vehicles are either Thai or Cambodians. Very few international vehicle traffic. After scrambling for awhile (and I waited 20 minutes), they gave me the TM2 (Information of Conveyance) and TM4 (Crew List) forms to fill. I filled them up and returned it to the immigration officer. Got my passport stamped, and returned to me. 10 baht fee (USD0.30) – which I suspect is the official fee as I noticed every local on a scooter passing through the border also paid the same amount. Obviously, I didn’t ask for a receipt. Next stop, Thailand customs control. I handed my vehicle log card to the customs officer. She took it and keyed something into her computer. I think the Thai customs have a computerised system, and since I’ve been through Thailand before, they seem to have my records. And before long, the customs temporary import permit was printed. I signed on it and a carbon copy was given to me. No fees asked. 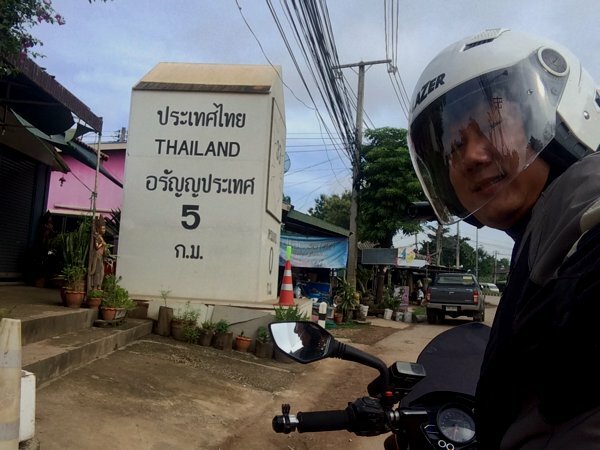 Total cost of border crossing – 10 THB. Goodbye, Cambodia. Hello again, Thailand! Immediately after crossing into Thailand, I noticed a pretty huge wealth disparity between the two sides. Thailand, being the richer neighbour, is so much more developed and has better roads. Oh, and I’ve got to start getting used to riding on the LEFT side of the road again. 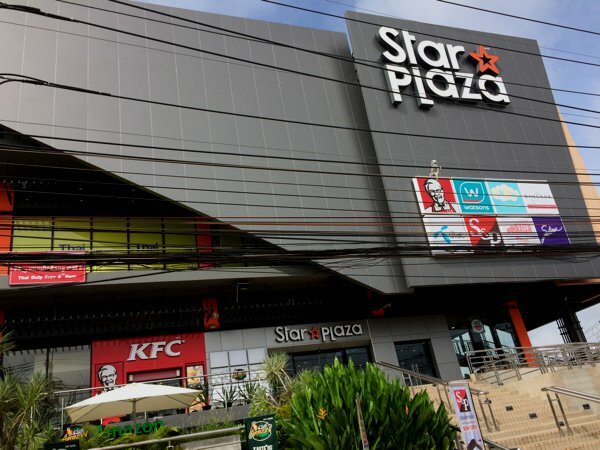 Star Plaza in Aranyaprathet, Thailand. I haven’t seen malls like this in quite a long while! After spending some weeks in Laos and Cambodia, where things are just a little less developed, I had a sudden yearn for some urban treatment. I didn’t want to head into Bangkok. First, I’ve been to Bangkok several times (always flew in though). 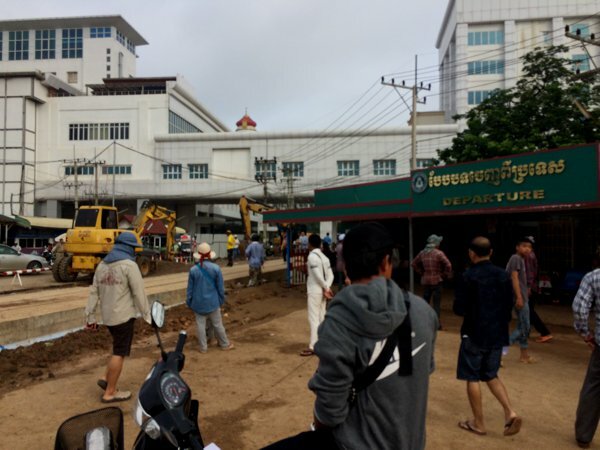 And next, I’ve always hated riding into big cities of developing nations – the experience in Phnom Penh and Vientiane has been more than enough. So, instead, I headed to…. Siem Reap – Poipet – Pattaya. Lunch and some urban treatment. Kinda reminds me that I’m a city boy after all. 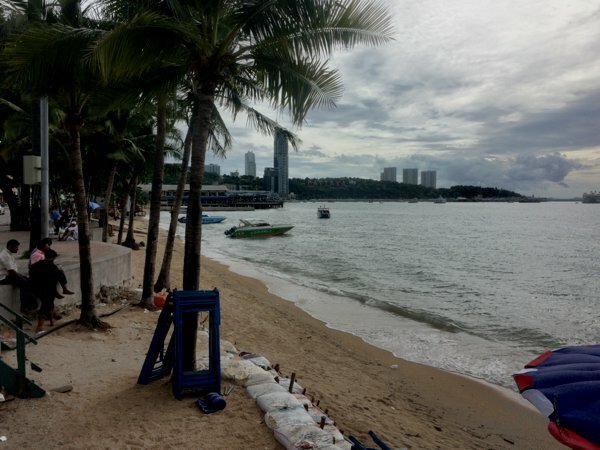 Strolling down Pattaya beach in the evening. Haven’t seen a beach in quite a while.